This revised edition is state-of-the-art and includes important topics such as dual career couples, interracial couples, military counseling, families with special needs children, addictions counseling, grandparents in the parenting role, and much more. 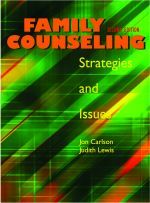 This book is a fresh, lucid approach that will help your students understand the major issues in family dynamics and how to deal with them. This practical and up-to-date work covers major strategies and issues that all professionals need to know about.